Shopping at Battle Harbour is very limited on this historic island in Southern Labrador, but the General Store carries what is needed. The fog has settled in over the historic fishing village of Battle Harbour in Southern Labrador, Canada and through its thickness, the lights from the General Store send out a golden glow. 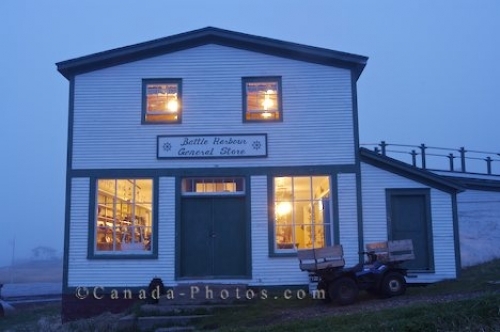 The General Store is the only building on the island where any shopping can be done but the store carries all the required necessities if staying overnight at Battle Harbour and is well worth looking through when visiting. Battle Harbour is accessible via a foot passenger ferry which leaves from Mary's Harbour during the months of June through to September. General Store on a foggy evening in the historic fishing village of Battle Harbour situated on Battle Island at the entrance to the St Lewis Inlet, Viking Trail, Trails to the Vikings, Southern Labrador, Labrador, Atlantic Canada, Canada. Picture of the Battle Harbour General Store on Battle Island in Southern Labrador, the only shopping location.